Get ready for the heat in the Dawn Sleeveless polo by Puma. 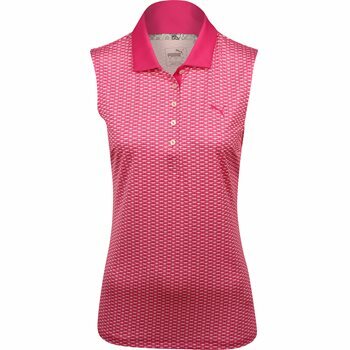 The sleeveless design and moisture wicking help keep the skin dry when the temperatures are high. The polo is made of polyester and elastane, offering durability for machine washing; resistance against shrinking and wrinkles; and stretch for a comfortable fit and freedom of movement. Design details include the Puma cat at the left hem, a sublimated pattern with a solid collar, and a 5 button placket for closure adjustability.